This notion has taken a particularly firm hold of Western civilization over the past few years as the Church of Foodieology (to which I should be considered at least an associate member) has risen in membership, fame, and power. What’s that? You don’t believe me about the power of foodieism? Dude, I have two TV channels at home dedicated to round-the-clock displays of glistening, delicious, artery-obstructing stuff to cram into my gaping pie-hole. For perspective, I’m pretty sure I only have one channel dedicated to religion, and I think comparing Food Network‘s viewership with EWTN’s is like comparing attendance at a Reds game to one of the Puddinpop’s little league outings. But I digress. This post is about bacon. I’m sorry…where was I? Oh, yes, bacon makes everything better. In recent years, we’ve really put that assertion to the test with new and ever more inventive ways of inserting smoky, salty, bacony flavor into consumable goods. I’ve heard tell of bacon doughnuts, bacon foams, bacon candy, bacon vodka, bacon mayo, bacon bourbon, bacon, bacon, BACON! Oh, and we didn’t just draw the line at consumables, either. No, no, we’ve been busy with our bacon. Check out this article, The 10 Most Creative Uses for Bacon. Don’t forget bacon cat, too. You know Bacon Cat, right? 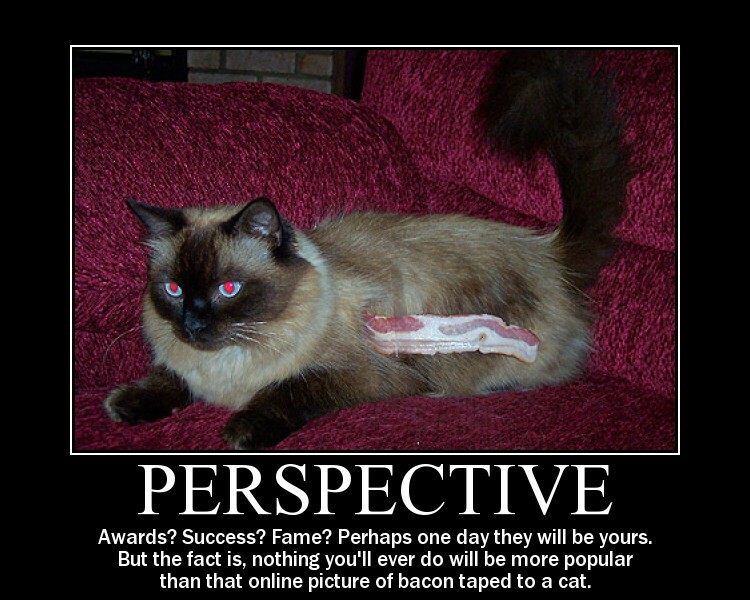 That was that thing when SF Author (and my own personal role-model/hero) John Scalzi taped a piece of bacon to his cat, snapped a picture of it, and posted it to his blog, thereby igniting an internet meme (is that even a word? How does one pronounce it?) that’s thrived for more than half a decade. Incidentally, that’s pretty damned impressive. I’d almost say that six years of Bacon Cat defies reason. Why? Because the internet is a big, transient hive-mind with the apparent attention span of a ADHD-riddled lemur. Two months ago we were ready to shut half the thing down in protest of SOPA. But if you referenced SOPA online today, some melanin-deficient pre-teen troll is likely to smugly point out that you misspelled “soap”. Yet Bacon Cat lives on. Thrives, even. Then again, as I’m pretty sure the internet was founded on cat pictures and bacon, so I suppose Bacon Cat’s longevity shouldn’t surprise me. Anyway, what prompted all this bacon-based babbling? I was thinking the other day about the statement posited above, how we all agree that bacon makes everything better. Although I have seen the opinion occasionally offered that maybe the concept has jumped the proverbial shark and at this point we’re forcing bacon into things it might be best left out of, I’d still say most people continue to accept the universally beneficial powers of smoked, cured pig belly. But if it makes (almost) everything better, what does it make best? What would be mediocre without it, yet is elevated by it’s inclusion, above even all other bacon-improved foods? Of all the bites bacon benefits, what does it bolster best? This is not a rhetorical question. Leave a comment, please, explaining what food you think is but a pale, flavorless version of itself without bacon’s salty boost.